Did you know weight loss is more about what you eat than how often you exercise? Sure we all know exercise is important for overall health and toning up the body, but eating metabolism boosting foods will help you shed the weight fast and keep it off! Check out our Metabolism Boosting recipes and weight loss tips to get to your goal weight, to maintain a healthy weight or just ward off weight gain. Hi, I’m and after a lifetime of battling obesity I found the answer, eat all natural metabolism boosting foods and you’ll never need to diet again! I created this blog to help others like me, people who have struggled with their weight, and who want to change their bodies not just for overall appearance (and confidence!) but also for better health and longevity. My best selling cookbook and popular blog has helped people all over the world change their eating habits and thus change their bodies and health. I invite you to join them and I and Lose Weight by EATING! What is the WeightLossTopSecret plan all about? Preservatives and chemicals and additives… oh my! There is a reason we as humans are at our heaviest! WeightLossTopSecret helps us get back to the way we ate before the food companies started packing food with extra sugar, chemicals and all the nasty additives that help them save money and cause us to gain weight. What if I told you that you could lose weight eating pizza, pasta, cupcakes and all your favorite comfort food recipes? Sounds too good to be true… I know, but thousands have tried it and lost weight, maintained their weight loss, gained self confidence and better health all while eating the foods they love. My motto… life is too short, just eat the darn chocolate! I’ll show you how to accomplish your weight loss goals, teach you how to cook (or cook in a new way) and impart my years of weight loss knowledge, I invite you to join in the WeightLossTopSecret movement, so come along. Here at WeightLossTopSecret we don’t believe in rules, we believe in goals. Set a daily goal and you’ll strive to meet it, set a rule and all you’ll want to do is break it! Find out more about our 4 pillar goals in my WeightLossTopSecret cookbook or right here on the website. Here is a video I made for eHow on proper meal planning. When I began writing the cookbook I had a few goals in mind… I wanted to pack it full of yummy comfort food recipes, loads of stunning photos and most important I wanted to keep the cost low, weight loss is hard enough, it shouldn’t cost you a fortune too! 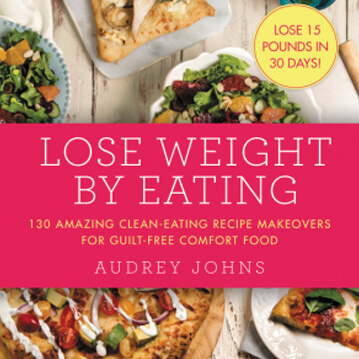 In my cookbook WeightLossTopSecret you’ll find 130 comfort food recipes from pizzas and pasta dishes to your favorite snacks and treats, and of course yummy baked goods, fantastic drinks (skinny margaritas anyone?) and may I just say, the dessert chapter is the longest chapter in the book. P.S. I’m working on another book now… so lots more yummy treats are on the way!